They are likely my favourite flower of all. So many colours to choose from with different characters and beauty abounding from their leaves and petals. I especially love the aroma they share, it is soft and delicate and oh so lovely. With roses in my mind I decided to design a style that was different than my Rose Onie Collection, a classic and sculptural collection. 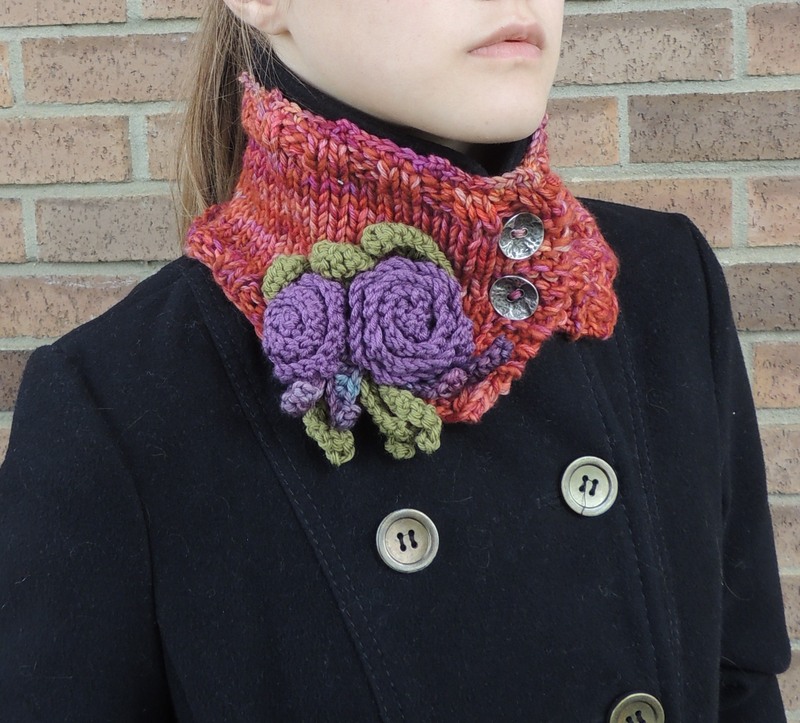 The new Rose inspired collection is called the Eclectic Rose, the collar scarf shown in the pictures. A brighter yarn collection with a more modern and eclectic look to the design. The bases are made with 2 strands of yarn one of Malabrigo Worsted Merino and one of Malabrigo Rios Hand Painted Merino Wool. I love working with more than one strand of yarn as the outcome adds more texture and a unique colour way when combined. 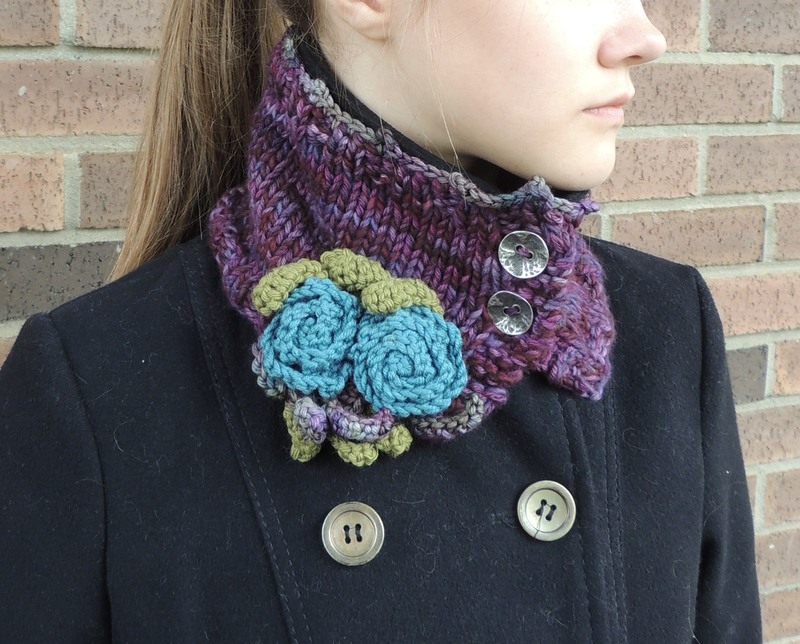 The roses on these three scarves are made with Sublime Aran weight Merino, Cashmere and Silk yarn. It is wonderfully soft and I love Sublime’s colours, they are fantastic. The leaves are done with Diamond Yarns Luxury Aran Weight Merino Wool. Another wonderful merino wool that eludes with amazing colour choices. Using various yarns on one design is enjoyable for me as I love to see how they work together and what the outcome is in the end. 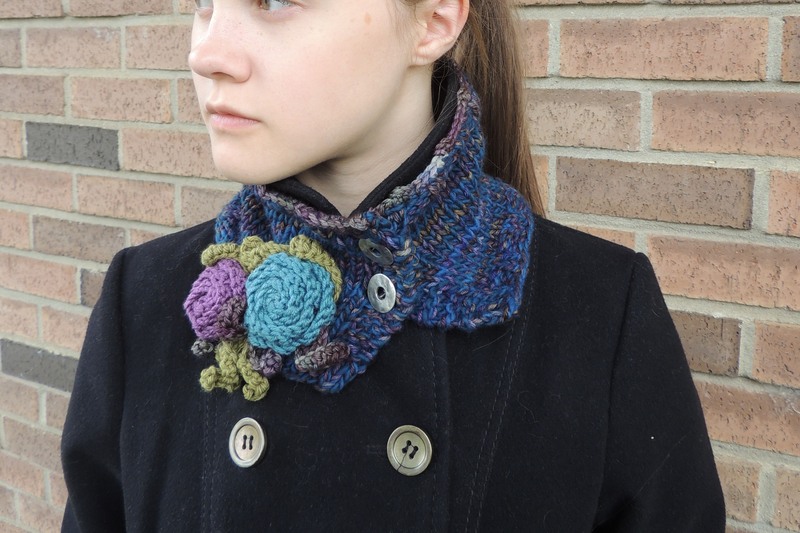 The style changes depending on what fibres and colours you are using on each piece. Keeps it interesting and enjoyable, trying something new that I am inspired to do that day. I love making Wearable Art pieces, there is a freedom in deciding with each piece what it should become even when I started with the same knitted or crocheted “canvas” I had designed before. I can add a personal touch that I am inspired by or the customer is inspired by making it one of a kind. Inspiration can come from anywhere, just let your mind see things in a new and exciting way. Then turn it into something new for you to enjoy or share with others. I must warn you it is addictive! Enjoy your day and try to see things differently today. Find your inspiration! ← Victory in Victoria…Yarn finds of course!